A TRIBUTE TO VIET NAM VETERANS! please select the proper price option shown below. (Nashville) - "NO WELCOME HOME", recorded by WWII combat veteran Larry Lee Phillipson, is a TRIBUTE to VIET NAM VETERANS who never received the honor or respect due them upon their return from the war. The US flag that so many had fought and died for did not ceremoniously wave over the Union it represents. Upon discovering that the State of Wisconsin was organizing an event to belatedly acclaim the veterans for the sacrifices they made in Viet Nam, Phillipson, along with Nashville song writer Cheryl Durham Owens, collaborated on the lyrics and music of "NO WELCOME HOME". The album title song made its debut during the celebration at Lambeau Field, Green Bay, Wisconsin, Thursday, May 20th thru Monday, May 24, 2010. The special event is titled: "L Z Lambeau". Phillipson, an 86 year old WWII patriot served in the US Marines, 4th Division, 2nd Battalion 14th Marines - E Battery. His combat tour in the South Pacific included Roi Namur, Saipan, Tinian, and Iwo Jima. He is one of the living who stood at the base of Mount Suribachi, under heavy shelling, and watched "Old Glory" as she was proudly raised. This was one of the most memorable moments of the Pacific Theater in WWII. Entertaining since he was eleven years old (75 years), Larry has had a varied life style ranging from vocal music, custom fiddle building, antique collecting, vintage autos, and repairing cylinder phonographs. He is also a poet and the author of a book "From Rocks to Rockabilly". 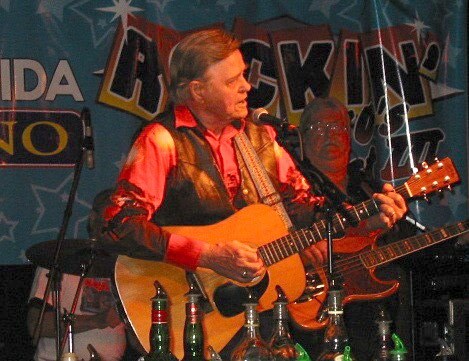 Larry was inducted into the Rockabilly Hall of Fame in 1999. Born in Milwaukee, Wisconsin in 1923, Larry moved to Coral City, Wisconsin when he was three. 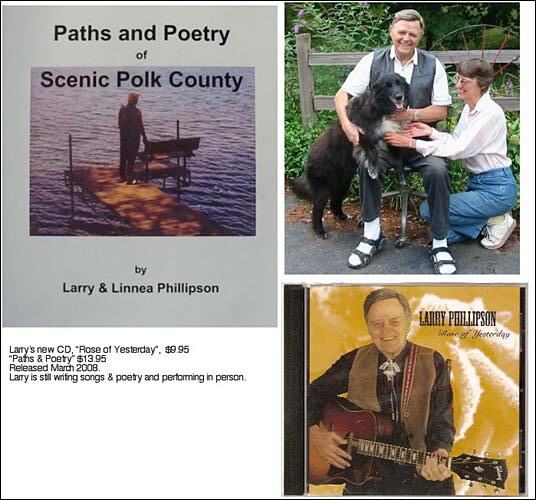 He is now a resident of Amery, Wisconsin, and has dedicated this project to his late wife Linnea Rae Phillipson. Patriotism as summarized by Larry: "We live in the greatest country on earth. Respect the flag and the nation it represents"! "Rockabilly Fest 5-16-07, Green Bay WI, Oneida Casino. Larry had a great time at the Fest meeting his fans from Europe and all over. 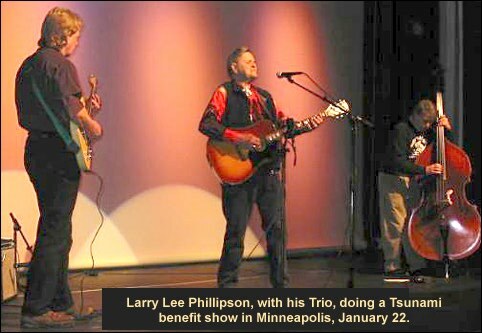 LARRY LEE PHILLIPSON is featured in a great article on "The Old Times" website. In August, 1998, Cees Klop of White Records, Rotterdam, Holland released five of Larry's recordings (along with recordings of other artists on a world wide CD of rockabilly songs): "The Milwaukee Road" (original version), Miama Road," "The Swamp Jumper's Stomp," "Bitter Feeling" and a later cut of "Milwaukee Road" are also written by Larry, who in fact, writes all of his songs. Since then Larry has bee awarded a plaque of honor. The proclamation reads: "Thank you, Larry Lee Phillipson, for the decades of entertainment and all the records that you have produced. Though you are a World War II veteran, not all heros are made on the battlefield, ballfield or movies. It takes a good deal of perseverence and intestinal fortitude to be commited to something as long as you have been. You are truly an American Hero. Thanks for all the memories. From your hometown of Coral City, Blair, America and the world. Signed by Stanley Bartaler, Mayor of Bair; Rod Noen, State Senator. Sixteen of Larry's recordings are listed in Gary E. Myers' book, "Do You Hear That Beat," Hummingbird pub. 1994. Larry has many other recordings that are not listed in this edition. "Bitter Feelins" is also listed in "4th Edition of American Premium Record Guide" pub. 1992. Tapes and CDs are available by writing to: Linmea Music. 1027 85th St., Amery. WI 54001. CDs are $12, cassettes $9, plus 1.25 postage. Straight from the hip, here are the times of a man who has been through some truly remarkable things. Larry Lee Phillipson, as the reader will discover, is his own man. I was a 21 year-old marine (2nd battalion, 14th marines, 4th marine division) when I saw action on Iwo Jima. I also took part in the landings on Saipan, Tinian and the Marchalls. I was one of the more fortunate, but the sight of such massive human waste will always be embedded in my mind. Recalling the events of the day (Feb. 19, 1945), after several days at sea, it was pre-dawn when we reached our destination. The aroma of coffee and the smell of scrambled dehydrated eggs filled the mess hall as we silently & somberly ate morning chow. Glancing at all those glum faces, I became aware that this could well be the last meal for many of them, including myself. The ship lifted with a sudden jerk as the anchor was dropped. Immediately we left for the tank deck where the amphibious ducks were assembled below, and one by one, we climbed down the nets to the ducks. The beach became a seen of chaos and confusion as we were rushing ashore. Bullets and mortar rounds splashed us with cold, salty sea water, just missing a direct hit many times. Then the driver shifted in reverse, as the duck was coming in against the tide. The driver had to back up to make another try to ride with the incoming waves in order to gain the momentum required to climb the steep bank ahead. Simultaneously a terrific explosion shattered the air. A shell had fallen in the exact spot the craft had been before it had been reversed. The duck nearly capsized while climbing the bank, but we made it ashore. The crew worked diligently to unload the 105 Howitzer which came ashore with us on our duck. The going was rough, the 105 crew had to dig a gun pit, fortifying it with sand bags. "Number two gun, Fire"! Came the command, and with a resounding blast, the 105 rocked on it's wheels. By this time the sun was setting. I remember how hard my heart was pounding. Lying there in the darkness my thoughts wandered back to my family in Whitehall. I wondered if I'd ever see them again. But the peaceful moment was interrupted by a cry for help. Running towards the cry, I found four marines lying in blood drenched dungarees. Flashes of artillery fire illuminated the grotesque corpses of scores of dead marines. The shell fire was becoming more severe, and one of the wounded, in a state of shock, was digging with his hands in an attempt to escape. These ghastly sights were almost unbearable. But the beach head was secure. The initial mission had been accomplished. Although I was so fortunate to come out alive, I feel a twinge of anxiety for those who sacrificed so much, but also, a sense of pride swelled within me for having had a chance to do a part to help keep a great nation free. As a result of perforated ear drums from shellfire at Iow Jima I received a purple heart. I ran around a lot after the war looking for the pot of gold at the end of the rainbow. 1948 was the first time I entered a contest in El Paso, Texas where Tex Ritter was performing. I watched him every night and got to learn his "Rye Whiskey" pretty good. However I didn't win. I didn't even come in second, so I said enough of this, and went back to Milwaukee. I had almost given up for good but then I entered a contest at the Fox Wisconsin Theatre and won a nice Silvertone guitar which help me to forget about leaving the music scene. In 1950-51 I won first prize in a contest and a friend (who became my agent) said I'll put you on the road. However, your name Larry Phillipson is too long. How about calling your self Larry Lee. That's how I got the name. Anyhow, I first got the bug by joining various amateur contests in and around Milwaukee. Around 1952 I started to play in bars professionally on the weekends. So I started to play and sing the few songs I knew. My friend (agent) Cactus Jack, a country singer, said to me "Larry we've got to write songs with a beat to it because that seems to be the trend to get some life into the crowds." So that's what I started doing. I started to write country songs with a beat to it. The Larry Lee Trio (Bill Wood, Ralph Hanzel & Howie Davis) was the hottest outfit going in Milwaukee at the time, appearing six nights a week at the top night spots, and for two years performing with the 'Hot Shot Revue' on WTMJ-TV. We also played with the Grand all over Wisconsin, Michigan, Minnesota and other states. One time on the way to a show through Mellen the heater in my convertible wasn't working, I froze my face. We heard on the radio that it was 49 degrees below zero. We were blocks of ice by the time we got to Superior. I recorded "Bitter Feelings" in Chicago in 1953-54. That was the first original acetate version. The other side was "While I Was Waiting For You." Stu Glassman was the owner of a record distribution corp. on Water Street, Milwaukee. Because of him we got a notice from RCA Victor saying that I was going to get a contract and I thought something would happen. My friend Bob Martin a disc jockey was pushing the acetate a lot on the air for about two weeks. Later I asked Stu Glasman about the contract and he said they (RCA) were going to put it on hold. They found a new artist they were working with and I thought what a strange name. It was Elvis Presley. That was the end of that. Later I formed another band called "The Westernairs". I had Ralph Headle and Billy Wood. We needed a bass player. This guy came to town and said he played bass, his name was Jimmy Ellen. He said he just came from Nashville and had roomed with Elvis Presley. He told Elvis he'd never get anywhere singing that stuff like that, why don't you stick to country & Elvis told him 'No I want to do something different - Rockabilly. I guess that's how I was too. I never liked to walk into a group. I wanted to do my own thing. Anyway, Jimmy got the job and later we re-recorded "Bitter Feelings." In 1959 we went back to Chicago to cut the song along with the flip side "Talking To Myself". When the record came out it was on the Cinch label. We paid for the session and the pressings. We ordered several hundred copies and sold them all over. James Kirchstein re-released the Cinch single on his Cuca label. However, the sound quality on the Cuca pressing is bad due to the fact that instead of using the master tape, he made a dub off the Cinch pressing. I also recorded a single for Cuca called "Miami Road" and "Little Miss Teardrop." In 1958 I was with Patsy Cline & Porter Wagoner at the Wisconsin State Fair. I got to be friends with Patsy Cline and we would walk around and watch sideshows, etc. She was really a nice person. One day it rained and Porter and us were playing penny ante in a mobile home there and then Patsy came in crying so I said deal me out and went over to talk to her. She said "I'm quitting this business because I talked to my agent and out of 850,000 copies sold of "Walking After Midnight" all I'm getting is $1200. Wait a minute Patsy I said, "you've got your foot in the door and anyone of us would give our left leg to be there. It costs money to get started and after a while the money will be rolling in." "Don't quit now - you're too good. You will be a big star. She wiped her eyes and said I guess you're right Larry." In March of 1963 when her plane went down, I was playing in McKenzee, Tennessee and I went out looking for the crash site. There was nothing left of the plane but at the foot of the tree it hit was a pair of her gold shoes. She sure liked to buy shoes. When Jim Reeves died the following year I started to think it's a good thing I'm still alive. I didn't become a big star but I was still in there plugging away. Almost all the people I knew or played with are dead.